The Intellivision was the first game console that I ever owned. It was Christmas of either 1979 or 1980 that I got mine (I do believe it was 1979, based on the pictures I remember on the box), and I played the hell out of that thing for the next few years. It’s the system that really got me into video gaming, and except for a brief cynical period I went through in the mid 80’s, I’ve never looked back. The Intellivoice is, obviously, a separate unit. Apologies if you need to squint to read that, but I need to keep these file sizes small. I have also replaced nearly all of the games I had when I was a kid – which was a lot of them. 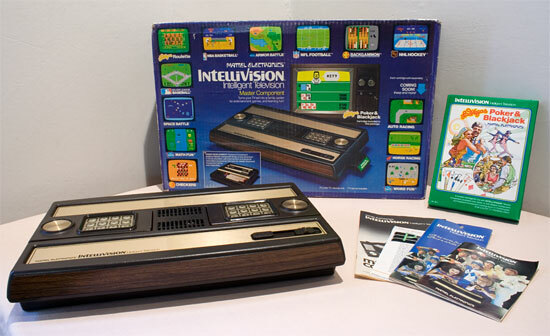 Fortunately, Intellivision games are very easy to find in their original boxes – people seem to like to keep gatefold game boxes, and they probably thought it’d be too easy to lose the overlays without them. 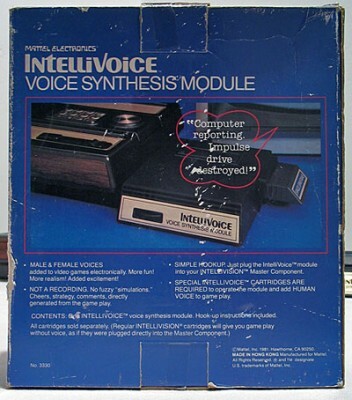 I do also have the box for my Intellivoice, which was a goofy little peripheral that added a few phrases of poorly-digitized voice to the few games that would support it. 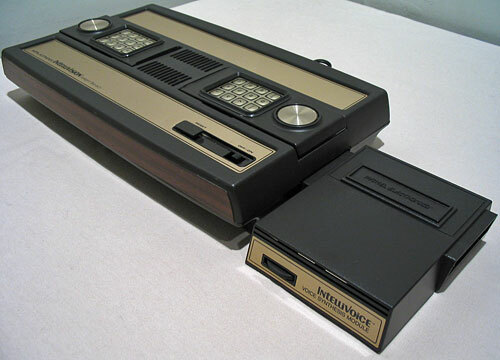 It seems ridiculous now, but at the time this was revolutionary – no other console could really do this (I think there may have been one or two games for the Atari 2600 that had one or two words each), and not even computers were powerful enough yet. I still remember the phrases “target in sight!” and “bombs away!” spoken with an extremely fake southern drawl in B-17 Bomber – the only Intellivoice game I had as a kid. “NOT A RECORDING.” Ha! The voices were all digitized, so yes, they were recordings. Mattel wanted you to think that the system somehow generated these voices on the fly, which would have required quite a bit more computing power than the Intellivoice or the Intellivision had. The Odyssey 2 (which apparently you need) had THE VOICE attachment, which did a MUCH better job of digitizing voices. 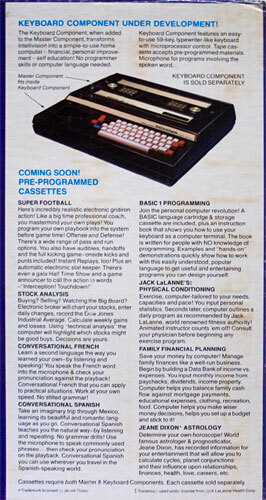 It also had an awesome cartridge (Type and Tell) that let you type whatever you wanted and THE VOICE would say it. Some of the games also talked… it was MUCH better than the 4 Intellivision games that utilized the Intellivoice… nice collection!